Liver Detox, Dieting and Weight Loss ~ The Reluctant P.O.W. Toxins are broken down by the liver for elimination from the body. Every drug, toxic chemical, pesticide or hormone is metabolized by the enzymes pathways inside the liver cells. Fat-soluble toxins are attracted to fat cells in which they can be stored for years or a lifetime. These toxins can be released when you exercise, stress or start fasting as the fat cells are broken down. This can be accompanied by headaches, stomach pain, nausea, fatigue, dizziness and heart palpitations. Fatty liver disease, also known as NASH (nonalcoholic steatohepatitis), is on the rise and often accompanys persons overweight. 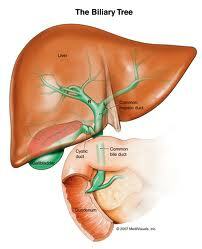 Today, nearly 100 million Americans have a NASH liver, the most common form of liver disease, many not knowing it. Nearly one third of children (over age 5) and teens are overweight in the USA and could develop fatty liver disease. Many will need a liver transplant by their 30s or 40s. In Canada, childhood obesity and fatty liver disease are also on the rise. Diets that are rich in unsaturated fats, cholesterol, and sugars (fructose and sucrose) and low in vitamins C and E are known to cause NASH. The liver has two main detoxification pathways. The first converts a toxin compound into a less toxic compound during which free radicals are released. The second pathway the liver adds another substance (glycine or a sulphur molecule) to a toxic substance to render it less harmful. Like your car, your body has different components that require attention and from time to time maintenance. In both pathways the liver needs nutrients in order to complete its task. Vitamins C (1000mg), E (800IU) and natural carotenoids are for the first pathway and glycine, glutamine, choline and inositol are required for the second. Choline is of special importance. There are several vitamins in addition to the above that help the liver. Vitamins B1, B2, B3, B5, B6, B12, Folic acid, Biotin and Lecthin help the liver do its job. Omega 3 fatty acids (1000mg fish oil) has been shown to improve insulin resistance. Good sources for these nutrients are eggs, broccoli, cabbage, Brussels sprouts, cauliflower, raw garlic, onions, leeks and shallots. Milk Thistle is one plant that has been documented in protecting the liver and will detox your liver (milk thistle liver detox). It does not however appear to reduce damage from the past. Probotics and lower iron intakes seem to help avoid other liver complications. The liver is the primary pathway for your body to eliminate fats. It is also the first stop for sugars before they are converted into fat. A proper functioning liver, combined with a healthy, vitamin and fiber rich diet is necessary in order to lose weight effectively.